One lucky rescue pup has a new set of wheels, thanks to an app for sharing photos of adorable - and often adoptable - dogs. Kennedy was found dumped on the side of the road in rural Georgia, dehydrated and beset by fleas. 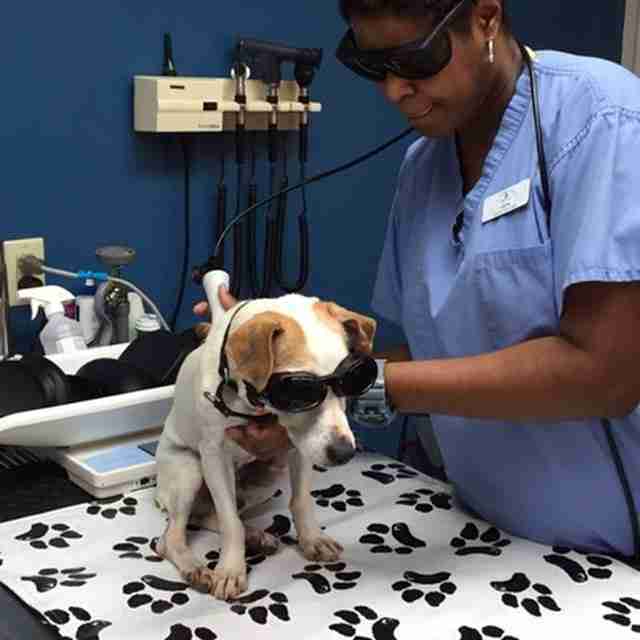 A volunteer brought him to the Georgia Jack Russell Rescue, Adoption & Sanctuary, where he was put through tests and x-rays and diagnosed with degenerative arthritis of the spine. 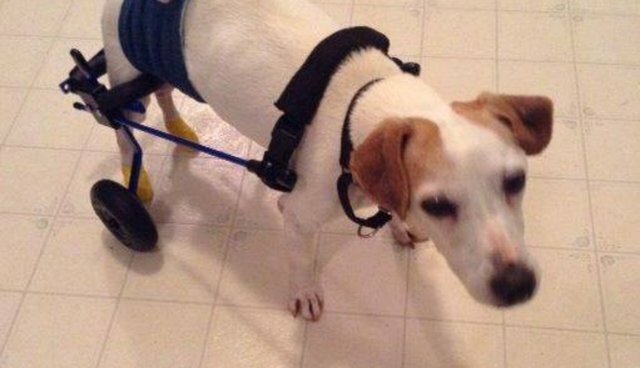 "He does absolutely great with his wheels," Donna Durham, a founder of the Georgia Jack Russell Rescue shelter, told The Dodo. A representative for Dogly, Melody Serafino, confirmed Kennedy's new lease on life. "He can now walk and play without pain!" she wrote in an email. The funds for these grants come from donors, investors and Dogly's family and friends, Serafino said; the app is free for users. Dogly, which just launched in the fall, wouldn't disclose how many users it has at the moment. The app is young but it runs smoothly - this user had no problems uploading a picture of his parent's beagle. Kennedy is up for adoption, and considering his age, about nine or 10 - and what he's been through - his joie de vivre is inspiring. "He tries so hard to run and play," Durham said, "and with his wheels he's able to do that." Dogly is available on iTunes and Google Play. This post has been updated to reflect how Dogly's "loves" contribute to shelter donations.